Rupert Pupkin Speaks: Warner Archive Grab Bag - SECOND SIGHT and HOT TO TROT ""
Bronson Pinchot hit it big on television in 1986 when the show PERFECT STRANGERS was brought into the world by ABC. It ran for eight(!) seasons and was something of a cultural phenomenon during that time. Though many actors fail to make the jump from TV to movies, it is always intriguing to see the varied results. Another interesting thing that Hollywood tends to do is often put out two or three movies of the same kind right around the same time. 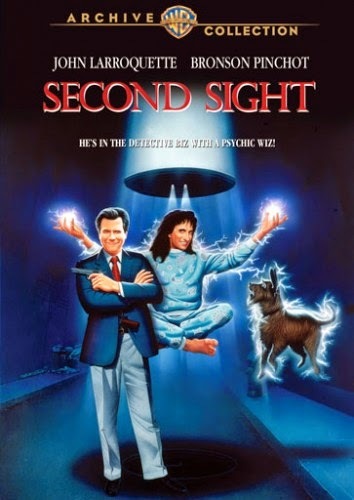 In this case, SECOND SIGHT was the second major studio comedy based around psychics to come out in the late 1980s (VIBES preceded it the year before). VIBES came out in the summer of 1988 an made less than $2 million at the box office. Although I am a particularly big fan of that film (I love both Jeff Goldblum and Cyndi Lauper in it), it didn't exactly burn up the box office and wasn't highly praised by critics at the time. So fast forward to more than a year later, when SECOND SIGHT is released and proceeds to be something of a big flop in its own right. SECOND SIGHT had not one, but two big TV actors in leading roles. John Laroquette (of NIGHT COURT fame) was the other headliner. This was basically a huge deal for both Pinchot and Laroquette in that it marked not their feature debuts (both had worked in films in smaller roles prior to this), but their first opportunity to attempt to carry a movie. Sadly they failed, but it's difficult to fault the actors exactly. There's so many different things that could have caused SECOND SIGHT to not quite connect with audiences in 1989. First off, it's a movie about psychics. VIBES had demonstrated the year before that audiences in the late 80s, as much as they may have been into psychics, were not necessarily interested in seeing comedies about them. Also, perhaps it was a tough spot to put both the lead actors in. I mean, they were most widely known for their work on TV and though it would seem a natural thing for their fans to want to see them in movies, there seems to be some disconnect there with people. Perhaps the line of thinking is something like, "Well I can see so and so on TV for free every week, why would I pay to see them in a theater?". Now I'm not 100% sure that that idea holds and water, but I feel like I can see how it may have applied and been partially responsible for many movie careers struggle to take off actors that made a name for themselves in television. Another factor that most definitely impacted SECOND SIGHT was the 1988 Writers Guild of America strike. This apparently led to problems with both the script and the cast at while the film was in production. Regardless of the cause, it's a sad thing when a movie fails as it then becomes less of a priority for the studio that put it out. By priority I mean that they are certainly not concerned with it coming out on home video (or DVD). SECOND SIGHT was released on VHS in mid to late 1990. It was unavailable on DVD until this Warner Archive disc was released in 2010. That's a long time for it to be unavailable, though some would most likely say that's not a bad thing. As for me personally, I can see some charm to it now even if I prefer VIBES by a whole bunch. I just like there there are a few psychic comedies out there for some reason. A few years back, I heard a Q&A with Bobcat Goldthwait that was part of him promoting his then new film GOD BLESS AMERICA. The interviewer (Jeff Goldsmith, whose podcasts I am a huge fan of) mad the apparent mistake of bringing up HOT TO TROT found himself in the unenviable position of the same wrath Goldthwait might unleash on a heckler at one of his standup comedy gigs. It was an unfortunate thing because I am a big fan of both Goldsmith and Goldthwait, but it was made quite clear from his response that Goldthwait may have less than positive feelings about the film at this point. Who can blame him really I suppose. It's got to be a tricky thing to surmise if someone is making fun of him by bringing it up or if (in the case of Goldsmith) they have genuine affection for both the film and Goldthwait's career as a whole. 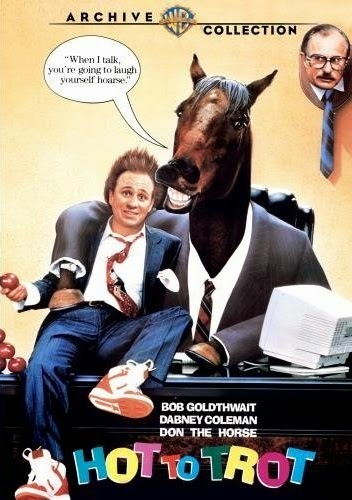 Apparently it's been said that when Goldthwait was sent the script to HIT TO TROT, he wrote "Why would I do this?" on the cover. His manager responded by writing a big dollar sign on it. Bobcat is a guy that I really like a lot. I certainly can't fault him for doing HOT TO TROT (which supposedly had Joan Rivers originally cast in his role) because to be honest, I am a fan of the movie and had I been in his position circa 1988, I'm pretty sure I'd have taken the role too. So this movie reminds me a little bit of an old Kurt Russell Disney movie called THE BAREFOOT EXECUTIVE. In that film, Kurt Russell's character discover's they his girlfriend's chimpanzee has a knack for picking the highest rated TB shows. In HOT TO TROT, Fred Chaney (Goldthwait) inherits a talking horse named Don (voiced by the late great John Candy) who has a talent for picking stocks. Being that Chaney has also inherited part of a stock brokerage firm, this comes in handy for a while. Supposedly, Elliot Gould was originally cast as the talking horse, but when the movie didn't test well, Candy was brought in and he improvised a good deal of his admittedly humorous dialogue. The movie also stars a very prosthetically buck-toothed Dabney Coleman in an extremely hyperbolized semi-reprisal of his role in 9 TO 5. The film itself was nominated for several Razzie Awards at the time it came out (though COCKTAIL beat it out in most categories). HOT TO TROT is one of those "Only in the 80s" kind of movies that I personally miss very much. Maybe it's about nostalgia for a time when I was watching every comedy I could rent from my local VHS emporium, but they just don't make em like this now. I think I also connect Goldthwait with the early R-rated movies I saw as a kid (in his case obviously the POLICE ACADEMY films) so that's always been a fond memory for me I think. As much as Bobcat may not care for HOT TO TROT (or at least the experience he had making it), it's easy to see that it was a seminal experience that partially put him on the the path to becoming the very unique and fascinating directorial voice that he has become today. I've been a fan of Goldthwait as a director since SHAKES THE CLOWN (which was a huge favorite of my video store coworkers and I when I was in college) and I am always excited to hear of his next movie. I have a ton of respect for him as a person and a filmmaker. I highly recommend seeking out any of the interviews he's done in recent years to hear a thoughtful, intelligent and irreverent commentary on making films on an independent scale in this day and age. I am fascinated with the fact that I can love him for the director he is now and still maintain my affection for silly comedies like HOT TO TROT (which perhaps I'm a silly for liking but I do) he did in the 1980s. He's a pretty remarkable dude. Both of these films are available via Warner Archive.